It all started on March 12th when I had came home from a 12 hour shift. Right when I walked in she told me her neck hurt really bad. I looked at it, didn’t see anything. It was late so I sent her to bed. I was just thinking she slept on it wrong. Next day we went out of town. I noticed she was looking sick, I took her temperature it said 101. When we got home around 5pm gave her Tylenol to bring down her fever. Then showered her. As I was changing her she looked really pale. That’s when she mentioned her neck again, this time I felt a huge lump the size of a golf ball. I rushed her to the ER. At the ER her fever was 103. They gave her ibuprofen and Tylenol together. It stopped her fever for about 2 to 3 hours. They just sent us home saying she had a bacterial infection no meds to give her nothing at all. Next day 3/14/17 she looked even worse. I decided to take her to a different hospital. When there her fever was at 104. They sent us home once again, saying she had swollen lymph nodes and her body had to fight it on its own. At this point everywhere I took her made me feel like I was making everything up. Like if I didn’t know my daughter. I made an appointment with her doctor on 3/16/17. Her doctor wanted to give her a shot of antibiotics. But something kept telling me to have her admitted to the hospital instead. Her doctor was fighting me saying she would be fine after the shot. But I didn’t give in so that same day she got admitted to JFK in Indio, CA. At the hospital she just kept getting worse, none of the medicine that they were giving her helped. At the time I didn’t know anything about Kawasaki disease but she had all the symptoms. On 3/19/17 I asked the doctor why her eyes were so bloodshot red. He then rushed out the room and came back 10mins later and said “your daughter has Kawasaki disease.” Kawasaki disease what was that all these question were running thru my head. How did she get it, how is it treated, was it something i gave her, is she going to be ok etc… the worse feeling ever not knowing how to help your child. The day she was diagnosed we were transferred to Loma Linda children hospital due to the fact that the hospital we were at did not have the right equipment or specialist to treat this disease. 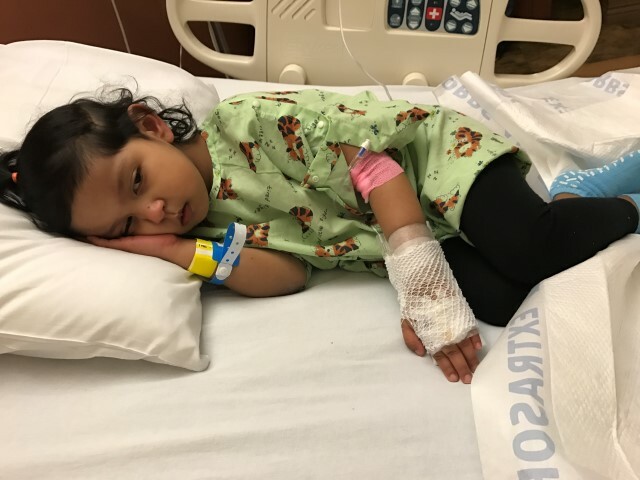 About an 2 hours arriving at Loma Linda Hospital they gave her the IVIG, they had to keep a close eye on her since they didn’t know how she was going to react to the treatment. She did very well, about an hour or so her fever was almost completely gone. She was discharged on 3/22 with a low dose of aspirin for 8 weeks. She saw a heart specialist at two weeks and then again at eight weeks. After the eight weeks they said she was good to go she did not have to take anymore medicine and ever since then she’s been fine. At first they sent her home with a bacterial infection, no meds nothing. Then they said it was just lymph nodes and that her body had to fight on its own with no meds. Doing very well back to her old self.